Attleboro narrowly missed out on a playoff spot last season, losing in its final game against a Div. 3 opponent and this year’s team will be motivated to try and get back in the postseason under new head coach Mark Homer, who made the switch from Oliver Ames where he coached the past three years, and with a new home – moving from Aleixo Arena in Taunton to the new England Sports Village just a couple minutes from the school. a lot of depth to call on this winter with only 15 skaters and two goalies on the varsity roster, but there is some experience coming back. Senior P.J. Elliott is a talented skater and stick handler who will be counted on to provide the scoring punch along with Jake Parker and Dylan Weallac on the first line. Sam McKenzie emerged last year as a physical presence and senior captain Eddie Noel will partner him on the top defensive pairing. Sophomore Evan Andrews and freshman Derek Rivet will battle it out for the starting goaltender position for the Bombardiers. There are several other underclassmen who could make immediate impacts, including sophomore forward Cam Littig. After being the first Hockomock League team selected for the prestigious Super 8 tournament in 2014-15 and then graduating 21 players, Franklin was supposed to need a year to rebuild, but the Panthers showed just how strong their program is by bringing home the Div. 1 state championship in a dramatic double overtime thriller against St. Mary’s at the TD Garden. It was the program’s first state title at any level since 1983. The Panthers graduated another large class of 13 seniors from last year’s champions and lost promising freshman defenseman Kevin Mackay who transferred to Dexter. Still, expectations remain as high as ever for the Panthers, who have won four straight league titles. Much of that excitement comes from the potential in the offensive zone with Franklin returning last year’s title game hero Luke Downie, leading goal scorer Jeremy Miller, and Brendan O’Reilly and the top line of seniors Joey Blasie, Adam Assad, and James Kilroe. Sophomores Matt Holmes and Zach Falvey will add depth to the offense. Defense is where the Panthers will have some new faces, although seniors Tom Sicchio and Stan Carter will add some experience to the back line. Juniors Jack McGrath and Connor Norton will make the jump up from the JV team to add to the defensive lines and freshman Collin Opet will also see playing time on the defense as well. For the third season in a row, Franklin will have a new No. 1 goalie with senior Cam Benhamand junior Owen Ginley will battle it out for the starting spot. The Warriors made strides last winter under first-year head coach Paul Carlow, including a regular season tie with Franklin and reaching the postseason for the first time since the program was moved back up to Div. 1. This season, Carlow is hopeful for a return to the postseason and to challenge for KP’s first league title since 2007, despite losing 10 seniors from last year’s roster. The offensive zone should be strong for the Warriors this season with several key returning players that put up solid totals last winter. Junior forward Collin Cooke is the main weapon after putting up 11 goals and 15 assists for a team-high 26 points to be named a league all-star. He is joined up front by senior Ritchie Lucente, who scored 10 goals and had nine assists last year, and senior Jacob Kelly, who finished with 11 goals and nine assists. KP will also return a few important pieces on the defensive side of the puck, including junior goalie Shane Frommer, who was 3-1-1 in his five starts last year. Frommer’s start to the hockey season will be slightly delayed after helping the football team win its first Super Bowl title. In front of the Frommer will be senior Jeremy Smith, who chipped in with three goals and four assists last season. Last winter was atypical for the Hornets, who missed out on the playoffs and finished fourth in the Kelley-Rex division, but Mansfield is hoping for a quick turnaround under new head coach Mike Balzarini, who makes the move from Milford. The Hornets have a number of returning players, including several from club or other school programs to bolster the depth. 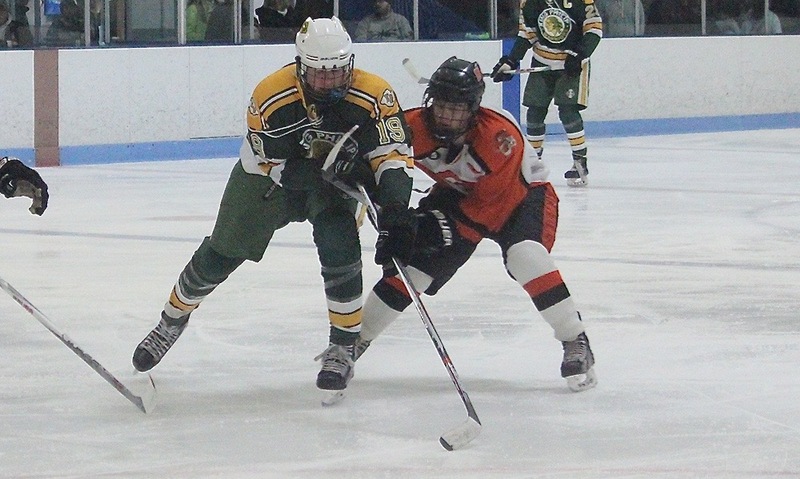 One of the returning players is Joe Olsen, who spent last year with a juniors program but will be a significant addition to the Hornets top attacking line alongside fellow seniors Matt Farragher and Chad Piotti, who both had solid years in 2015-16. Junior Cullen Anastasia is another forward to come back to the program and could step right in to make an impact. Freshman Chris Jenkins is going to be the center on the third line and classmate James Bezeau will also see playing time this year. On defense, the Hornets will be led by senior Cullen Murphy, a physical presence at the back and one of the leaders on the ice. Juniors Tim Arnold, Ryan O’Hara, and Tyler Oakley will also be important pieces on the top defensive pairings. Freshman Joseph Troiano will also be on the defense after he decided against attending Xaverian this year. The defense will be protecting senior goalies Brendan McKenna and Tony Rullo, who will each see time. Oliver Ames will be looking to keep its postseason streak alive under new head coach Sean Bertoni – a former standout goalie for Franklin. If the Tigers want to get back to the state tournament, they’ll need some help from their younger players; Oliver Ames has eight sophomores and four freshman on its roster this year. OA does have seven seniors and a group of experienced juniors that can help lead the way. Owen Gallagher (26 points), who led the team in scoring a year ago, is back along with Eric LeBlanc (18 points), Cullen Gallagher (13 points) and Max Ward (12 points). Junior Rory Madden also returns this season after a year away; Madden registered 14 points his freshman year. Defensively, seniors Jack Maloney and Jared Costello bring a lot of experience to the blue line. Zach Walsh will be back between the pipes after a strong junior season. The Tigers got to experience what the state tournament is like last season for the first time since 2006-07 and only the second time in the past two decades. Taunton had the fourth most wins in a season in the 44-year history of the program and scored a remarkable 106 goals last season, which was the best in the Hock. This year, Taunton will try to build on its historic season and make a quick return to the postseason. Leading scorer Tyler Pietrzyk has graduated but there is plenty of firepower returning for the Tigers this season, including senior forward Zack Albert who is coming off a 30-point campaign. He will be joined up from by classmate Jordan Hoey, who had 17 points last season and senior Cam Carnes, who had 10 points. Sophomore Cam Sneyd could be poised for a breakout year for the Tigers. Defensively, Taunton can lean on three-time league all-star Nick Terry, who will man the top defensive pairing. Mike Volkmann may be listed as a defenseman on the roster but he can get forward into the attack with 29 points a season ago. Junior Cam Welby will be a new addition to the defense after playing juniors all of last season. Senior Justin Chappell returns in net.